Four years ago today, violent demonstrations started in Cairo sparking the ‘Arab Spring’ which was to hit the rest of the region. The protest was the first coordinated demonstration in Egypt and was against poverty, unemployment, government corruption and most significantly the thirty year rule of President Mubarak. Egyptians were inspired by the success of the protests in Tunisia, as the president - Zine al-Abidine Ben Ali – was forced to flee the country. The demonstrations in Tahrir Square, Cairo (and other cities in Egypt) were at first just peaceful protests until the police and demonstrators clashed and led to violence. Over the many days of protest, there were thousands of casualties and many arrests. The government blocked internet access and mobile phone communication in an attempt to stop the demonstrations, which were organised on social media. But they continued nonetheless. On the 29th January, Mubarak appointed a new cabinet hoping to appease the demonstrators, but did not step down. It was not until 11th February after 18 days of demonstrations that he resigned as president, causing widespread celebrations across Egypt. The military were now in charge. An election was held between 28th November 2011 and 11th January 2012, but fraud was suspected and the results were discarded. Egyptians finally got the democratic presidential election which they had been fighting for in a two round election process in May and June 2012. Mohammed Morsi was the winner of these elections and stayed as president until July 2013 when he was overthrown by another uprising. The military were put in charge once again and remain in this position today. As part of the ‘Arab Spring’ there was also unrest in Algeria, Libya, Yemen, Jordan, Palestine, Lebanon, Bahrain, Iran, Morocco, Iraq, Saudi Arabia, Kuwait and Syria. 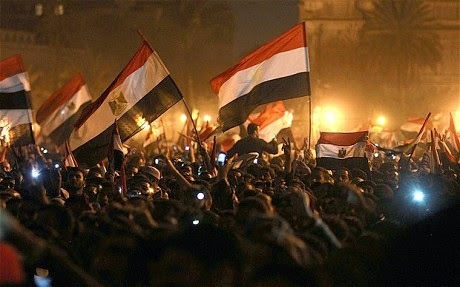 Today, Egyptians commemorating the 2011 uprising are protesting in Tahrir Square and 11 people have been killed so far. This timeline from The Guardian gives an interesting overview of the Arab Spring. With our TV listings this January jam-packed with Tudor dramas and documentaries, and new editions of Mantel’s books hitting the shelves, it seems that Thomas Cromwell is rising as fast and high in 2015 as he did in Henry VIII’s day. Cromwell has had his fair mix of good and bad press in historical dramas (as shown in Tracy Borman’s recent article here) but it’s Mantel who’s really captured the public’s imagination. Now, I’m fairly new to all this hullabaloo. His reign was what first got me interested in history, but for a long time, I avoided Henry VIII like the plague, thinking that he’s overrated and very ‘popular history’. It wasn’t Thomas Cromwell, or even Wolf Hall, that brought me back, shame-faced, into the Tudor fanbase, but now that I’m here, I’m buzzing about the upcoming BBC series, based on Mantel’s writings, as much as anyone else. Discussing her books, Mantel has stated that what she writes is fiction woven around the facts, but that she tries to keep it as accurate as possible. That said, pinpoint historical accuracy is now being plugged as the Unique Selling Point of the BBC series. Both Mantel and director Peter Kaminsky have said that they envisioned it being filmed almost as a documentary from Cromwell’s point of view, and Dr Lucy Worsley has walked away from the set with her only criticism being that Jane Seymour (played by Kate Philipps, image here) is ‘too pretty’. (Dr Worsley’s article is here.) All this historical hype really does beg the question: how much should we trust the series? I’m willing to take Dr Worsley’s word for it that the practical details are accurate (the costumes, ceremonies, use of cutlery, the state of the lawn, you name it), but having read Wolf Hall and seen both of the RSC productions, and I think it really does depend on the script and how the actors tackle it. Having seen him in various productions, I’m confident that Mark Rylance, playing our scheming Master Secretary, will deliver, and that Mark Gatiss’ Stephen Gardiner will be every bit as scathing and grandiose as the real bishop’s prose. Claire Foy, in her French hoods and stunning gowns, has already won me over as the ill-fated Anne Boleyn. The thing is, the RSC production seems to have been aiming for comedy, in the first play at least. The BBC service isn’t. I worry for characters like Thomas More. His portrayal in the books is certainly no Man of All Seasons, and has drawn a great deal of criticism. I’m no expert on More, but I do like to see one who is less than saintly. 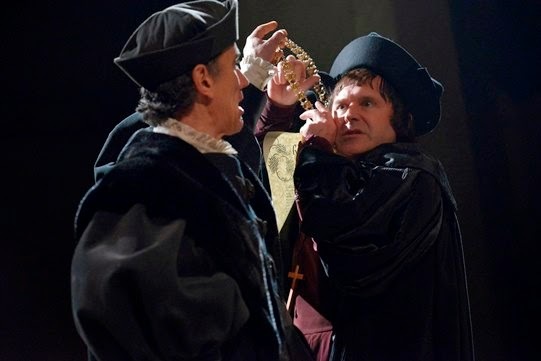 In the RSC’s Wolf Hall, he comes across as incredibly harsh and self-centred. In the books, on the other hand, I feel a great deal of sympathy for him. The TV series is likely to bring some of that sympathy across, seeing as Margaret Roper – More’s much-loved daughter, who did not feature in the play – has been cast, but it will largely depend, I think, on the directing. On the other hand, I do know a fair bit about Thomas Cranmer, and I find it difficult to fault cautious, candid, politically naïve scholar we see in Mantel’s books. (One thing I will say though, to add to Lucy Worsley’s criticism of the TV casting, I am disheartened to see a bearded Cranmer at Anne Boleyn’s coronation (image here) when the unwritten rule was that good Catholic priests were clean-shaven. Only a minor niggle.) Giles Taylor’s interpretation in the RSC production was certainly endearing, but would probably look incredibly out of place in the BBC drama, and it could be difficult to get Cranmer’s subtle personality across without the aid of Mantel’s prose. I think this – the removal of Mantel’s prose – is what’s most dangerous about both the RSC and BBC productions. Without the subtleties of her writing, and the brilliant insight we get into Cromwell, her flaws are much easier to notice. The misinterpretations of some of the Boleyns will be that much clearer, and other characters may be reduced to mere shadows, or villains, or saints. This is inevitable with any editing project as large as this, but in a production that has prided itself on its historical accuracy, it does set off a few alarm bells in me. Where I think the strength of the TV production lies is in Cromwell himself. Rylance has shown himself willing to find the threads of comedy in everything in the past, tragedies included, but I trust him to play this part straight. What we get, therefore, is a Cromwell who still remains mysterious to us, who still begs us to ask whether he looks like a murderer. In Bring Up the Bodies (the book), when Cromwell is playing the ruthless schemer, we know him well enough to consider him as our ruthless schemer, and I think the TV series will help to bring that edge back. I might post something once all six episodes have aired, but these are my thoughts so far. Of course, the Tudor hype this January doesn’t begin and end with Wolf Hall. Tomorrow (the 10th) at 9pm on BBC2 we have David Starkey teaming up with Lucy Worsley to present Britain’s Tudor Treasure: A Night at Hampton Court, to celebrate 500 years of the palace by reconstructing Edward VI’s christening. We also have documentaries later in the month about accidental Tudor deaths and Hans Holbein. Even if you don’t buy into historical fiction and period dramas, there’s still plenty to watch! The General Election Campaign begins!